Tenant repositories – databases, storages, retentions, shortcuts, Exchange connections, aliases of the tenant. In case of tenants “manage access” means that the logged on user grants rights for a second user to manage the tenant assigned for him, i.e. he gives tenant administrator permissions for this user. The second user’s exact permissions on the given tenant are defined in the assigned role. 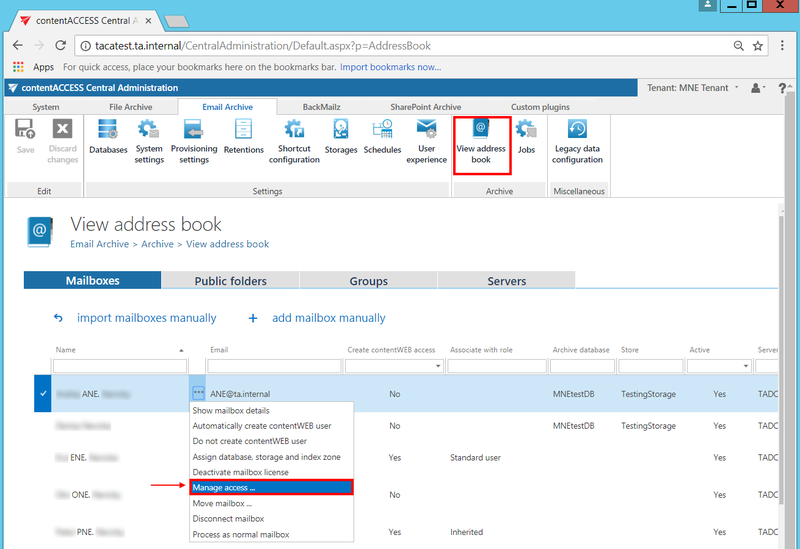 In case of archive mailboxes and file archive “manage access” means that the logged on user grants for the second user access rights to the archive mailboxes and file system archive on the assigned tenant. 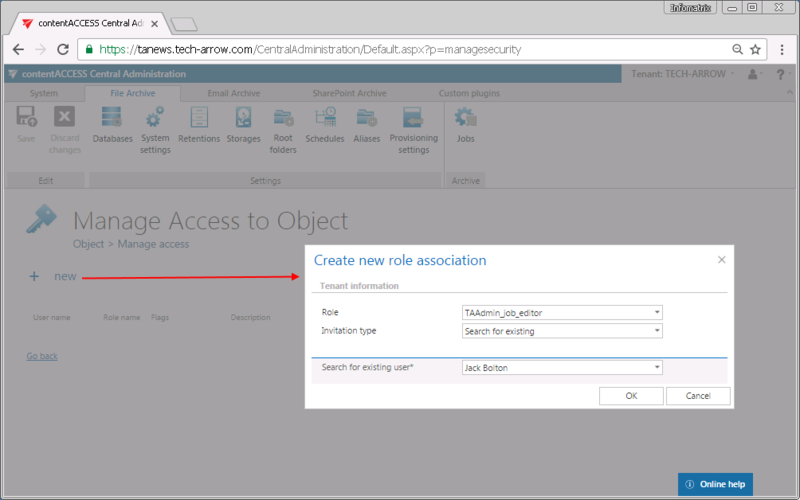 The permissions of the role assignment define what the second user will be allowed to manage. E.g. 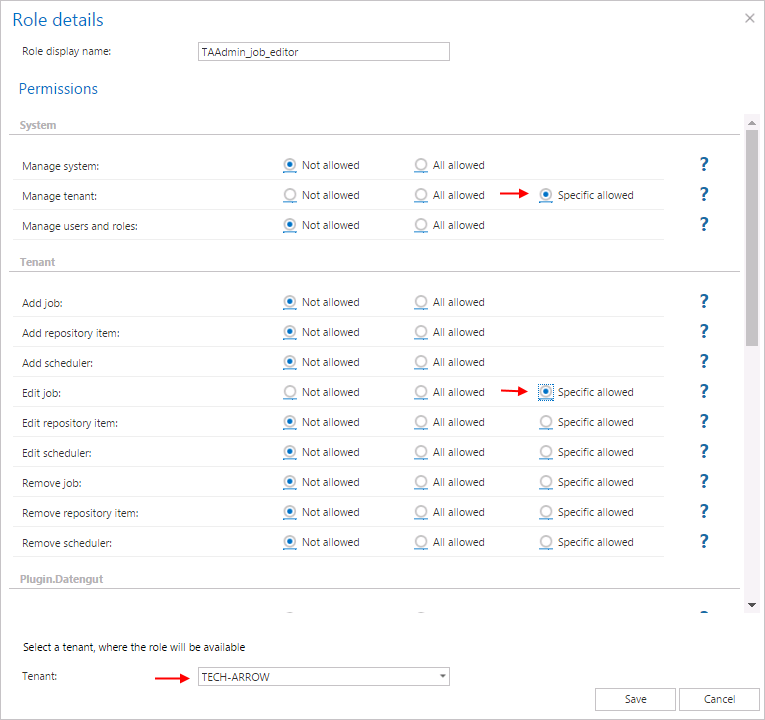 if my user called ”Job manager” has got “Edit job – All allowed” permission on the TECH-ARROW, but the “Delete job” permission is not allowed in his role assignment, then he will be able to edit the jobs of this tenant, but won’t be able to delete any jobs of the tenant. 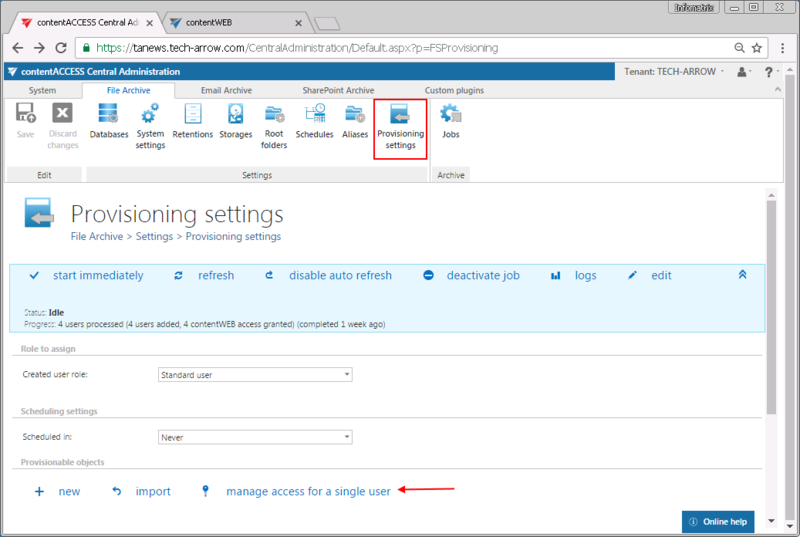 View mailboxes/View folders/View public folders – “All allowed” permissions on the TECH-ARROW tenant to be able to give access to the archive mailboxes/file archive/public folders for second user(s)on the tenant. The rule is that the logged on user must have equivalent or more permissions than the role to be assigned for a second explicit user. E.g. the logged on user is not allowed to assign a role for a second user containing permission “Delete job”, if this permission is not granted for him as well. 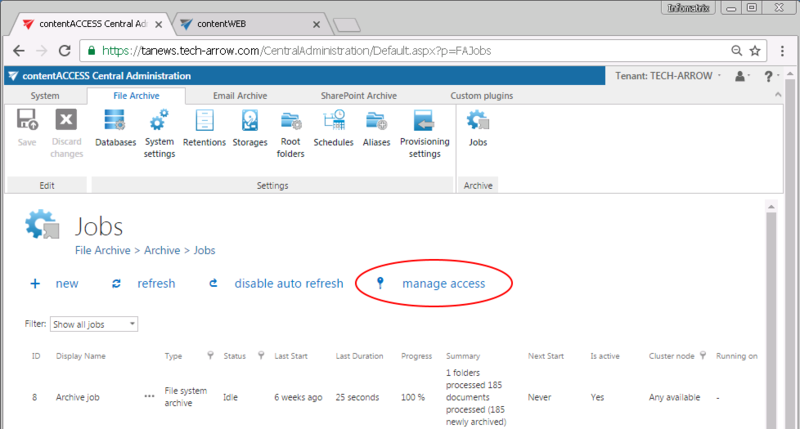 Manage access option is available for the logged on user on the respective pages of the Central Administration. First, the user needs to select an item (a given job, database, retention, mailbox etc.) from the list. In any case, by clicking the “manage access” option, the logged on user is redirected to the Manage access to Object page. Here he can manage access to the contentACCESS object. He clicks +new and the Create role association window opens. The Role dropdown list lists only the roles that the logged on user is allowed to assign, and those that contain specific permissions on that object (in this case the object is the job). Roles containing “All allowed“ permissions (e.g. 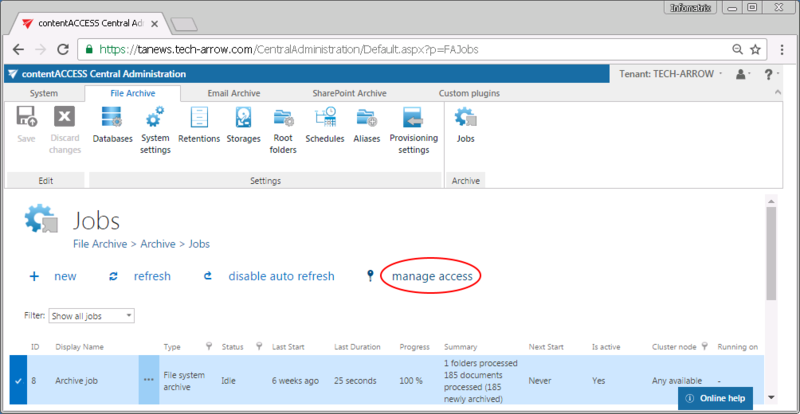 “Edit job – All allowed“ or “View mailboxes – All allowed”) cannot be granted on the “Manage access to Object page”. The user selects the role with the necessary permissions and assigns it to a new or an existing contentACCESS user. In this use case we grant access for Jack Bolton to edit the Archive job of TECH-ARROW tenant. 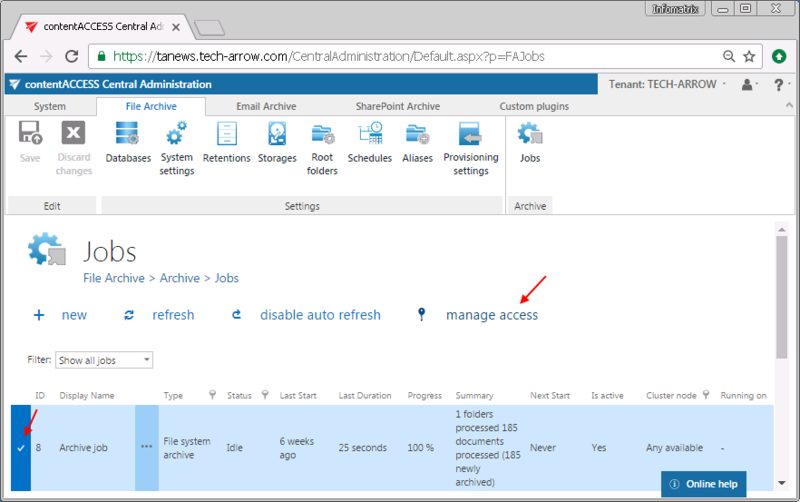 On the File Archive’s Jobs page of TECH-ARROW tenant we locate the Archive job, select it and click “manage acces”. 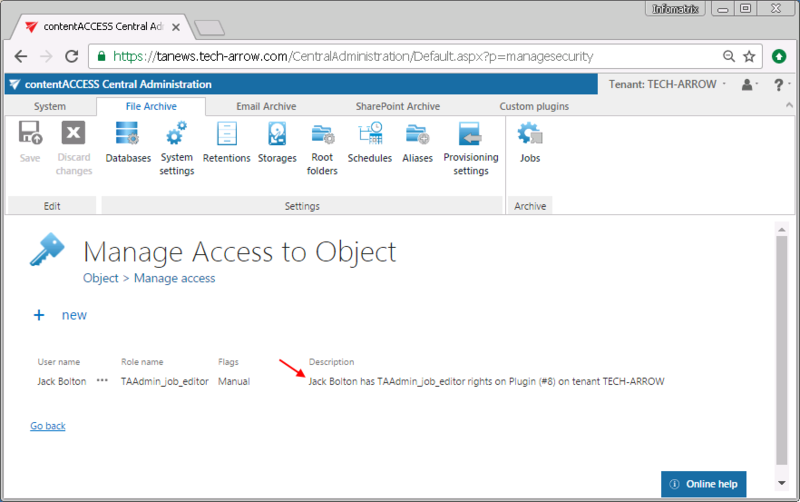 Our Jack Bolton user has now rights to edit the “Archive job” on the TECH-ARROW tenant, but he cannot delete this job from the list.